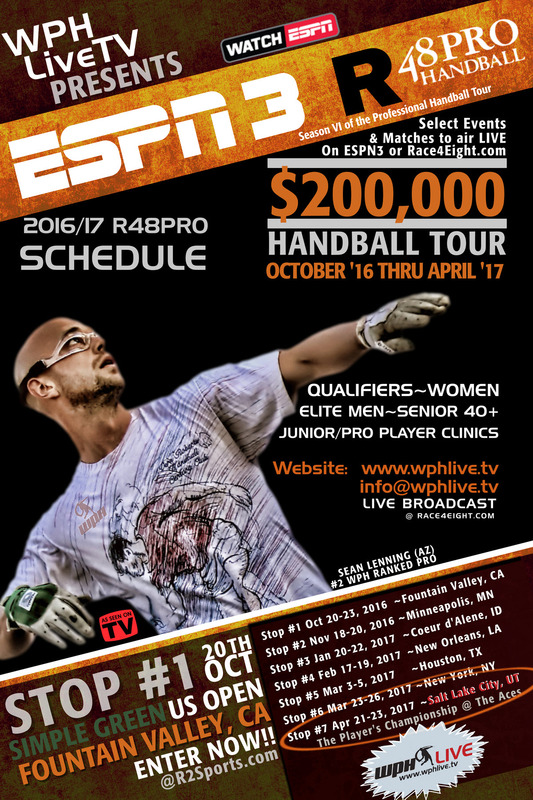 THE 2016/17 SCHEDULE & ESPN NEWS- We made our first announcement of the R48Pro Tour and debuted a full schedule of events back in January of ’16, but that’s not gonna stop us from re-posting a good thing. So, what’s new? The WPH will continue to run the professional tour, now entering it’s sixth season, with just one goal, says Vincent, “We need to inspire juniors, young adults and lifestyle athletes seeking a fun, safe, friendly and competitive alternative and we need to do it while staying financially stable.” WPH Tour will begin in October ’16 at the Simple Green US Open and continue thru the Player’s Championship in April of 2017. Editor’s Note: ESPN’s coverage of handball for the new contractual season began in September of 2016 with the Vegas 3 WallBall Outdoor World Championships @ the Stratosphere Hotel and Casino. Additionally, the WPH will advertise your business in 2016/17 as you show support for the sport of handball and WPH efforts; all at reduced costs. ESPN3 and WPHLiveTV look to seal the deal with a written contract by early Sept. More details to come. Please Share and keep following WPHLive.TV on their homepage, Junior WPH at www.jrwph.org, on-demand member’s only HD Videos by following the tabs at wphlive.tv; featured specials & interviews, plus YouTube videos @www.youtube.com/weplayhandball and the web store at www.thehandballstore.com.